Russula ochroleuca, the Ochre Brittlegill - for many years commonly referred to as the Common Yellow Russula - is found in all kinds of woodland from mid summer through to early winter. It is edible, but the taste is mediocre and sometimes rather peppery and so this abundant mushroom is not much prized for its culinary value. 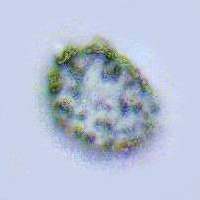 Not only is this one of the most common of the brittlegills but it is also quite distinctive and relatively easy to identify in the field. Very common and widespread in all kinds of woodlands throughout Britain, Ireland and mainland Europe, the Ochre Brittlegill also occurs in many parts of North America. 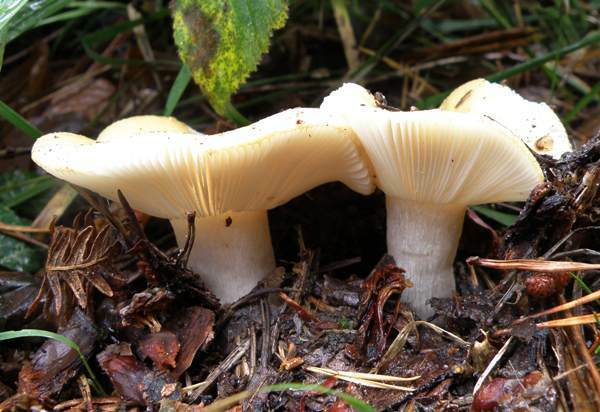 This brittlegill was described scientifically in 1796 by Christiaan Hendrik Persoon, who gave it the binomial name Russula ochroleuca by which it is generally know today. Synonyms of Russula ochroleuca include Agaricus ochroleucus (Pers.) Fr., Russula citrina Gillet, Russula granulosa Cooke, and Russula ochroleuca var. 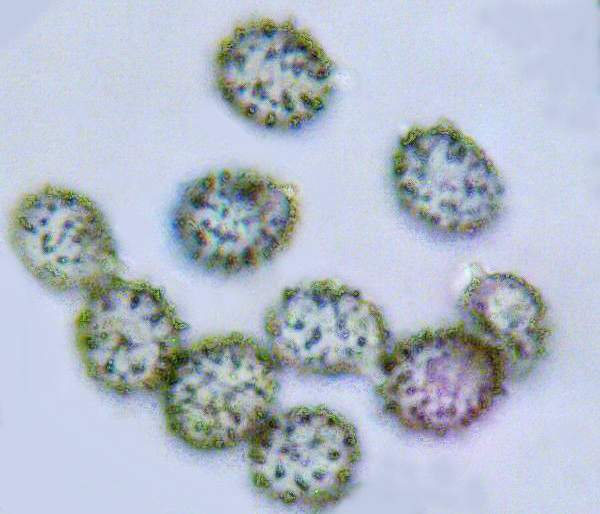 granulosa (Cooke) Rea. Russula, the generic name, means red or reddish, and indeed many of the brittlegills have red caps (but many more, including the Ochre Brittlegill, are not, and several of those that are usually red can also occur in a range of other colours!). The specific epithet ochroleuca is made up of the prefix ochr- which means ochre (brownish yellow). and -leuca meaning white; so ochroleuca means whitish (light) ochre - the typical cap colour. 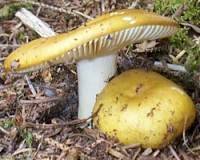 In Britain and Ireland Russula ochroleuca is one of the most common of all the brittlegills, and it is particularly plentiful in pine forests, often tucked in close to the bases of pine trees. 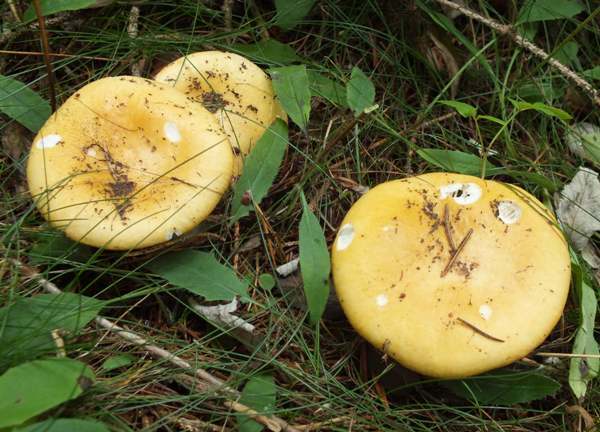 Unlike the superficially similar Yellow Swamp Brittlegill (Russula claroflava), with which it is sometimes confused, the Ochre Brittlegill is most often found in the drier areas of broadleaf woodlands and conifer forests where the soil is well drained. 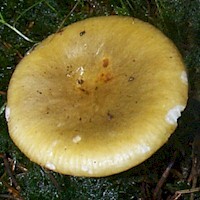 4 to 10cm in diameter, the ochre-yellow cap is initially convex and then flat, developing a slight depression at maturity. As the fruitbodies age, the cap margin becomes striate and the cuticle easily peels back over the outer two thirds of the diameter. 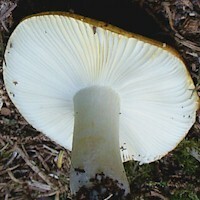 Most specimens remain yellow, but a few develop a green tinge to the cap. Beneath the surface, the flesh of the Ochre Brittlegill is white and brittle. The creamy-white gills of Russula ochroleuca are adnexed or adnate, narrow and brittle; they gradually turn a darker shade of cream as the fruiting body matures. 15 to 25mm in diameter, the stems are 4 to 7cm tall, white at first but greying slightly with age. The stem usually tapers inwards slightly towards the apex. Broadly ellipsoidal to ovoid, 8-10 x 7-8µm; ornamented with warts up to 1.2µm tall connected with very fine lines to form an almost complete network. No distinctive odour; taste variable from mild to fairly hot. Coniferous and deciduous woodland. In common with other members of the family Russulaceae, Russula ochroleuca is an ectomycorrhizal mushroom. Russula claroflava is found on wet ground under birch trees. 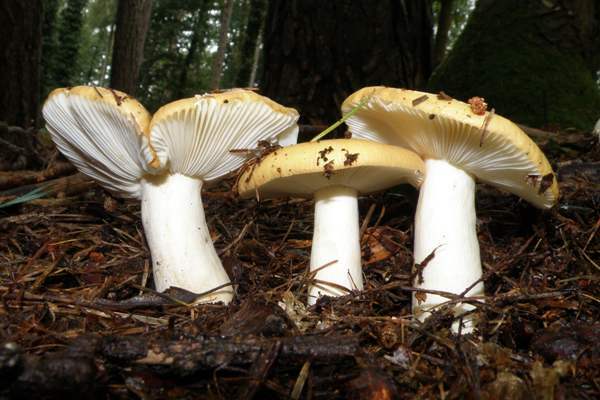 It has a strong fruity odour, has yellowish gills and provides a yellow-ochre spore print. 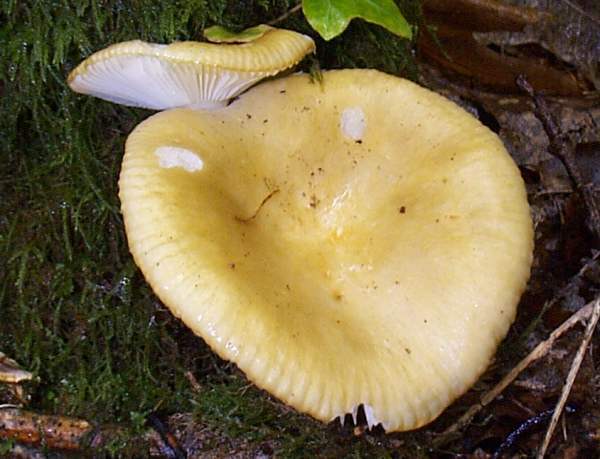 The Ochre Brittlegill is an edible mushroom, but it must be thoroughly cooked. As Russula fungi are difficult to identify with accuracy and a small number of species in this genus are known to be toxic toadstools, it is very important to gather for food only those specimens that you can identify to species level with complete certainty. If in doubt, leave it out.